It’s the most wonderful time of the year, but the holidays also come with their share of worries. Whether it’s crooks or cold weather, however, our smart security technology protects your peace of mind, helping you enjoy the season knowing that your home and family are proactively protected. Here are four seasonal worries that Alarm.com helps minimize for you. The stress: Delivery drivers aren’t the only ones working overtime this month. It’s bonanza time for the package thieves who prowl neighborhoods to grab freshly-delivered boxes and parcels from people’s front porches. How can you protect your packages when you’re at work? Solution! Alarm.com makes it easy to safeguard holiday deliveries. When the delivery person rings your doorbell camera, you’ll get an alert and be able to see them on your phone. You can start a conversation and tell them the best place to leave the package. You can even unlock your front door remotely, have the package left inside, then lock the door again. The stress: Securing your home while also getting your family into the car for a holiday road trip is stressful – especially during the holidays when you know that burglars are on the prowl. Solution! Should you forget to secure anything, Alarm.com will let you know. Not that your house will look empty, thanks to your Alarm.com-powered smart lights. You can automate them to turn on at a specific time, or at sunset, or on a slightly randomized schedule for authenticity. While you’re gone, your security system will also be a great deterrent. Even if they realize you’re not home, most burglars avoid houses with security systems, especially those with cameras. A yard sign from your service provider also lets crooks know that you’re protected with professional monitoring. The stress: A crackling fireplace guarantees holiday coziness for your family. It also comes with an element of danger, even when you’re extra-careful. Are your smoke detectors up to the job? Solution! 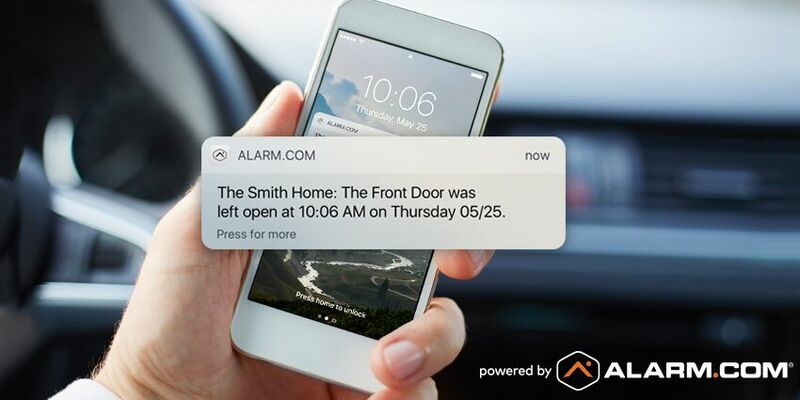 Alarm.com’s proactive fire safety technology is a modern homeowners’ essential. 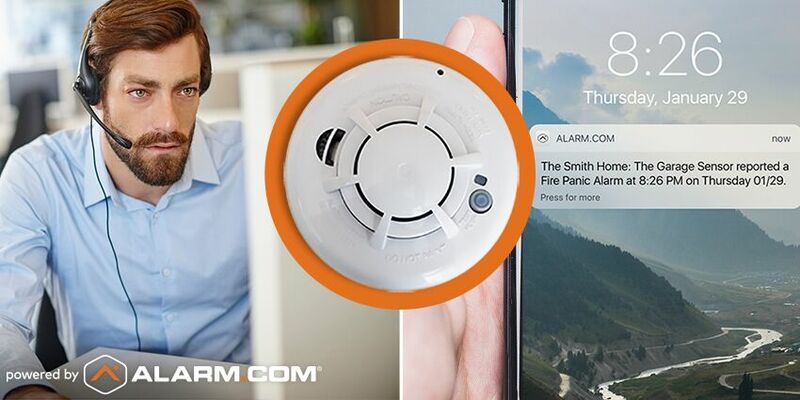 In an fire or carbon monoxide leak, your Alarm.com-connected smoke detectors alert everyone who needs to know: you (via in-house alarm and smartphone alert), your home’s monitoring station, and anyone you’ve named as an emergency contact. Meanwhile, Alarm.com also shuts down your smart thermostat to prevent fumes spreading, and turns on your smart lights to help you make a fast exit. The stress: At the cold end of the spectrum, burst water pipes are a common winter hazard for homeowners. When water freezes in a basement pipe, it can expand enough to split the pipe, leading to a fast-rising flood when the water thaws again. If a burst pipe goes undetected for long, you could be looking at a cleanup bill of thousands. Solution! Alarm.com-powered awareness can help you pre-empt or minimize a costly burst-pipe scenario. A temperature sensor in your basement can alert you if the temperature drops to a dangerous point, while a water sensor can alert you if a leak is detected and even trigger a water shutoff valve. In either situation, you can minimize damage by acting quickly. Even if you’re away, Alarm.com makes it easy to let a neighbor or plumber into your house. Ready to give yourself the gift of peace of mind? 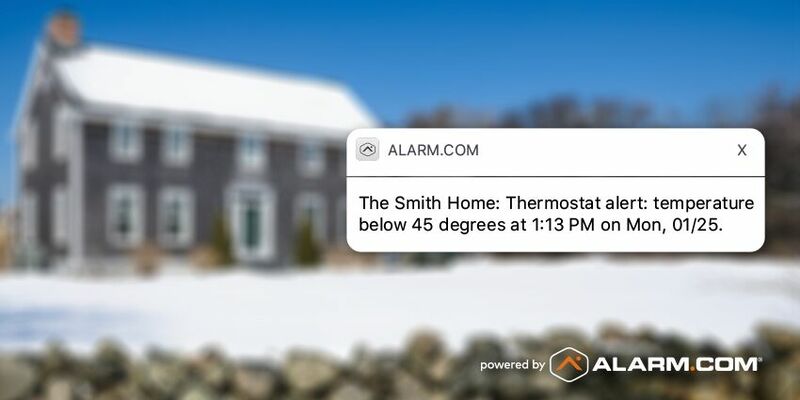 Professionally monitored and supported, Alarm.com is the smarter way to protect your home this winter and beyond. Enter your ZIP code in the box below to connect with an Alarm.com service provider today.